Safe-T-Beam Photo Eye Kit Series III includes infrared photo eyes, brackets. Compatible with all Genie garage door openers with existing Safety Beams. Kit includes Infrared eyes. This item will replace or repair your Genie Safe-T-Beam System. 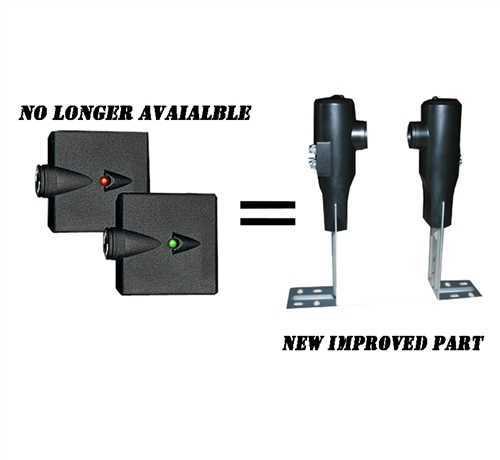 Works with all garage door openers made from 2005 to present. Same as part number 27220R Black with red and green indicator lights. What can I say; it's a Genie product. OK, I can get Genie products anywhere; right? Of course but these guys are price competitive, even with shipping and I shopped with confidence from my Family Room's favorite chair and didn't even come close to a flu germ. I was pleasantly surprised when I received the goods earlier than expected since I chose the cheapest shipping method.